For anyone who missed this year’s Barrie Jones Award Lecture a recording of the event can be viewed online here. The Barrie Jones Award recognises an individual’s contribution to society and outstanding achievement in science and outreach through work relating to astrobiology. It was established by the Open University (OU) Department of Physical Sciences in partnership with the ASB with the legacy of the late Barrie Jones (1941–2014), an astrobiologist at the OU, who dedicated much of his career to public engagement and outreach. 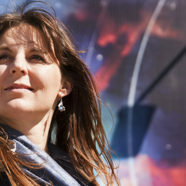 The inaugural recipient of the award was Lisa Kaltenegger, associate professor of astronomy and director of Cornell University’s Carl Sagan Institute. The award was presented in a ceremony on 7th July 2016 at the OU campus. The prize lecture is entitled “Thousands of New Worlds” and explores the ways in which we will soon be able to uncover the telltale signatures of life on other worlds beyond our solar system.